Weight Hacking - Kellbot! | Kellbot! I was dismayed recently to find my WiiFit calling me fat. Yes, it actually said (in its squeaky little voice) “that’s overweight.” While I’m not in the habit of letting an $80 plastic washboard dictate my lifestyle, my pants agreed. They said “lose 5 pounds or buy new pants.” Since I’m self-employed and like designer jeans I have no choice but to go with option one. Let me start by saying that I will do anything for points. It doesn’t matter what the points are for, I want them. When I was saving up for video games as a kid I drew little thermometers and filled them up as I saved my money, just like your college alumni drive does. I play Xbox Live games more than others because there are points and a leaderboard and achievements and the achievements get you points and I want them all. And lucky for me, WeightWatchers is all about points. On WeightWatchers you get a certain number of points per day, and all food has a set value of points (based on the fat/calories/fiber in it). And you can eat whatever the heck you want… as long as you don’t go over the points. You can also earn extra points by exercising, and get a bank of 35 spare points per week so you can eat normal people food and not blow your whole diet. Although tedious to some people, I find this to be an entertaining numbers game. And a challenge to hack my diet to maximum delicousness. For example: a Chipotle Burrito with cheese and guacamole is 22 points. By comparison, my daily target is 20. Obviously the cheese and guac are big contributors here, and I’m sad to see them go. But all in the name of progress (and not having to buy new pants) I forgo the cheese/guac. Now we’re down to 15. In theory I could just eat half the burrito and save the rest for tomorrow and thus not totally blow my points for the day. But that’s not much fun now is it? What’s interesting is that according to this handy-dandy calculator (which gets its values from Chipotle’s nutrition facts) the tortilla used to wrap the burrito is also a huge contributor. Nixing the tortilla and opting for the “burrito bowl” brings me down to 9 points. And it is a rather lot of food, so I eat 3/4 of it and save the rest for lunch tomorrow. So now I’m at 7 points, and honestly I didn’t miss the cheese/guac. That much. You can figure out the points values with some simple math or another handy-dandy calculator and the printed nutrition facts. For stuff you cook at home you can guesstimate using the ingredients list and google… there are a handful of points charts floating around that tell you the value of things like eggs, broccoli, etc. For folks who like beer there’s a nice points values for beers list. It’s by no means comprehensive, but gives me a rough idea. Most of the beers I like are around 4 points. Having to add up my points for everything has cut out a lot of my snacking, or at least made me switch to healthier options (bananas instead of chocolate). By skipping the cheese/guac on my burrito I freed up 7 points. An ice cream cone is about 5 points. I would much rather have ice cream than cheese on my burrito. It’ll take about a month before I can tell if it’s actually helping, but in the short term WiiFit has stopped calling me fat. Now it says I’m just festively plump. In addition to the WeightWatchers I’ve been biking more and getting pretty darn good at WiiFii hula hooping, but I think not eating candy constantly will go a long way towards staying in my current pant size. 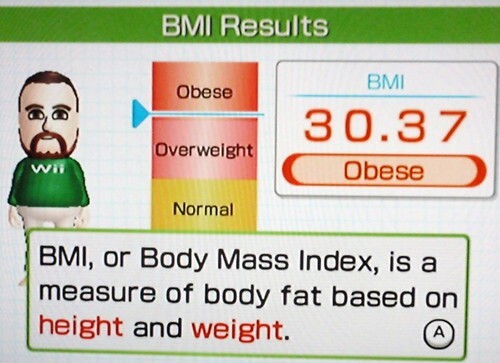 Don’t panic – Wii is just making sure you keep using their product, so they skew their health info. It’s well known. And typical of companies! Are you sure 20 points is not to little for you? I don’t mean you un particular, I mean regarding the WW’s calculation? If your BMI is 30ish you should be at 30 Points or something like it?! Please don’t “claim” to few points as it often only results in weight gain (I know, odd) or, less dramatic, stagnation. Yeah, 20 is where I should be… the attached photo isn’t actually *my* weight, my own BMI is around 24. I loved reading this; hearing someone compare video games to weight watchers and the accumulation of points was awesome. Good luck with your weightloss goals!